Ooooh, I love all that yummy dp, and your flower peeking out from the edges is a brilliant idea! 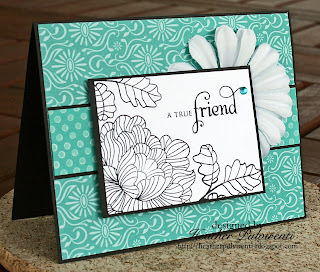 I'm so lovin what you're doing w/ the In bloom set!! Your mojo doesn't look lost to me! Love this! This is awesome! I love the color combo and mix of patterns. That black and white just POPS! If this is a bad day, then watch out folks! This really is good Heather. I just love how you use color. you crack me up when you talk of your mojo disappearing, because your cards are always fantastic!!! this is stunning! This is beautiful! I really love this one! Heather, this is so pretty! I love the colors!